Give your customers a bonus if they pay upfront for a longer time. With this thoughtful module longer payment cycles become more attractive for your clients because it adds automatically a defined period to the products next due date. The bonus is apparent during the ordering process and the bonus gets also confirmed by e-mail after receipt of payment. The module contains many configuration options! The module allows you to configure individually for which groups this bonus should be available. Furthermore, it is not only possible to activate the bonus for certain product groups, you can even activate the bonus for specific WHMCS product IDs. You can also exclude individual WHMCS products IDs from the bonus - this is useful for licenses or already reduced offers. 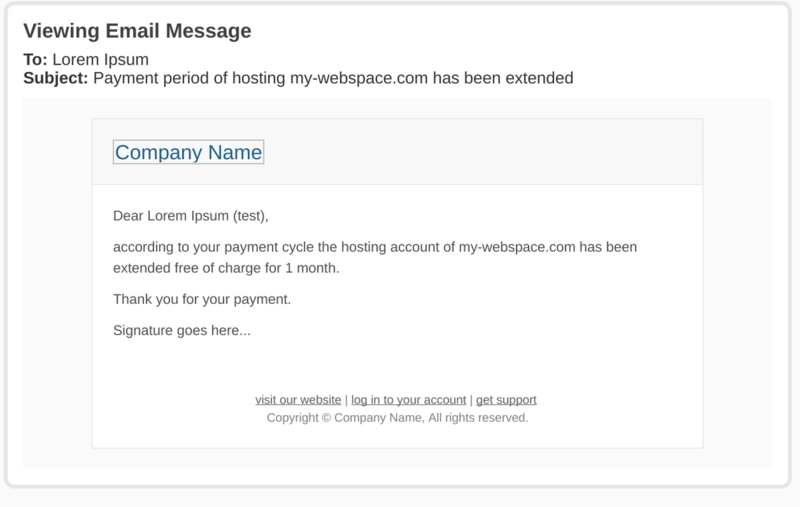 In addition, you can exclude individual customers from the runtime extension. Its even possible to exclude a customers product from receiving bonus (useful for individual contracts). Of course the module also has the possibility that the bonus apply only to orders after a certain date and not for older orders. That is useful, if you dont want to give this bonus to existing orders, but only for new orders. Bonus is shown during order process. After payment, client gets a mail which confirms that the next due date got updated. Apply bonus for monthly, quarterly, semi-annually, annually, biennially and triennially payments. 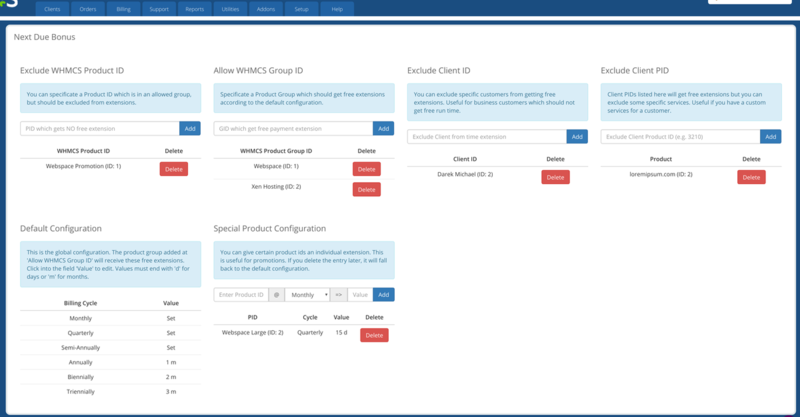 Apply whole WHMCS Product Groups for the bonus. Exclude single WHMCS Product IDs from the allow groups. Configurate bonus for single WHMCS Product IDs. Bonus can be defined in days and months. Exclude Client Product IDs from bonus. Define a date from which order date the bonus should be active (allows you to apply the bonus only for new orders). Module does work with WHMCS v6 and higher. It works with PHP 5 and PHP 7. For my part I can recommend the addon, have so far experienced no problems. It actually helps us to make prepayments more attractive.